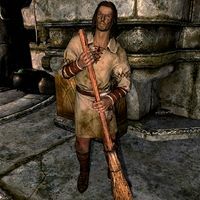 This article is about the NPC in Markarth. For the ghost in the Soul Cairn, see Morven Stroud. Morven is a Breton witchblade living in Markarth at Nepos's house where he works as a servant. He is an undercover Forsworn agent and bodyguard of Nepos the Nose, one of the most influential citizens in Markarth. He spends all of his time cleaning the house, without ever eating or sleeping. Morven becomes hostile and must be killed during your investigation into the recent Forsworn attacks. Morven's death can be avoided by pickpocketing and reading Thonar's or Nepos's journal instead of questioning them, then going directly to Eltrys. This page was last modified on 12 December 2013, at 22:35.